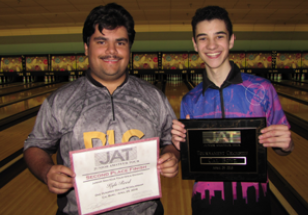 LAKEWOOD – The JAT headed to Cal Bowl for our 12th of 15 events this season. Lane conditions on the high end were tight to start but as the bowlers broke down the pattern scoring started to rise. Solomon Salama wowed the crowd with a remarkable run in the best-of-three matches putting up games of 257-267-278-258-255 for a 802 series, 1060 4-game set and a 5-game run of 1315- a 263 average as he struck to his 11th title. Scoring highlights also included Luke Mercado 193, Jonathan Fung 185, Alex Alvarez 183, Akayla Orosco 179 and Henry Lee 179.
. In the stepladder, the semifinal match was a one-sided affair as Ben Dinenberg advanced over Daniel Hong 218-128. Top-seeded Garrett Lee matched up with Dinenberg for a shot at the title. The match came down to the 10th frame as Dinenberg went strike-spare to force Lee to strike on his first ball to stay in the match. Lee’s shot went light and the 8-count gave the title to Dinenberg. Congratulations Ben on your first title! Marquan Rivers and Solomon Salama swept into the semi-final round with Kevin Banaag on the short-end of a 267-255 elimination game. In the semis, Kyle Reed and Marquan Rivers tied the first game with Reed winning the 9th and 10th frame rolloff, then Reed taking the second game by one stick to advance to the finals. On the other side of the bracket, Ryan Lee ran into a truck as Solomon Salama took him out 278-234 and 258-217 to advance to the championship match. In the final, it was all Salama as he took advantage of Reed’s tough carry game one 255-172. Then, after a lengthy lane machine delay and a switch of pairs, Salama continued on to a 213-184 win and the title. Congratulations Solomon on an incredible scoring run in the bracket and your 11th title! The JAT takes the lanes May 20th at Forest Lanes for our final event in the PBA Challenge. Just two events left this season- for all the details join our Facebook group at facebook.com/groups/bowljat or look for our ad in thisnewspaper each week!